NASA has released the first ever image that reveals the entire sun in a 360-degree view. 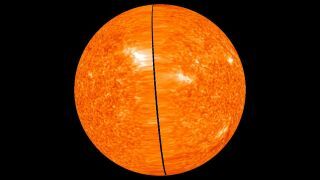 This view shows the latest image of the far side of the Sun based on high resolution STEREO data, taken on Feb. 2, 2011 at 23:56 UT when there was still a small gap between the two STEREO spacecraft. This gap began to close on Feb. 6, 2011, when the spacecraft achieve 180 degree separation, then completely close over the next several days. NASA has released the first 360-degree view of the entire sun today, just in time for Super Bowl Sunday. The photo comes courtesy of NASA's twin STEREO (Solar TErrestrial RElations Observatory) spacecraft, which aligned exactly opposite each other on opposite sides of the sun to capture the image. The ability to see the whole sun, front to back, will allow scientists to better understand complicated solar weather patterns and plan for future robotic or crewed spacecraft missions throughout the solar system, researchers said. "The sun is a truly complex object which influences many aspects of our lives," Richard Harrison, principal investigator for the U.K. instruments on STEREO, said in a statement. "In the same way that you would not expect to understand the workings of the brain by studying just a small part of it, a global investigation into the nature of our star as a complete object is essential to understanding how it works." Harrison is also co-investigator of NASA's SDO mission (Solar Dynamics Observatory), which contributed to the new 360-degree view with high-resolution sun photos taken from orbit. Scientists particularly want to better predict space weather and the violent eruptions that can spout from the sun's surface. These eruptions can damage satellites, disrupt communications and disable power systems on Earth. "Solar missions such as STEREO and SDO not only give us more information about star formation and evolution throughout our universe, but are of vital importance in our quest to further understand the sun's processes and the effect they can have on our planet and way of life," said David Parker, director of space science and exploration for the U.K. Space Agency. "This spectacular 360-degree view is another triumph for the STEREO mission, which continues to obtain some of the best images yet of the sun." The two identical spacecraft of the NASA STEREO mission were launched in October 2006. They are offset from one another, one flying ahead of the Earth and the other behind. SDO is the first mission in NASA's Living with a Star program and was launched in February 2010. SDO's unique orbit allows high-resolution images of the sun to be recorded every three-quarters of a second.